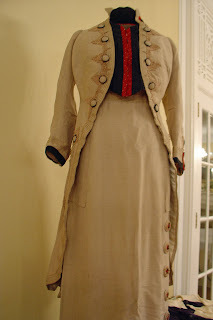 On Sunday, January 25th, I went to see a presentation: Holding It Together In Tough Times: The Humble Button, presented by the Original Costume Museum Society. Colleen Miller, owner of Button, Button, Canada's only button shop, detailed the history of the button over time and common in all cultures. 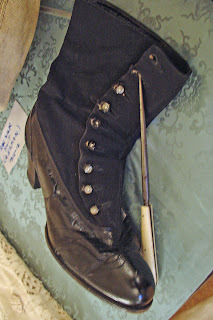 Ivan Sayers, costume museum curator and collector, displayed a variety of l8th, 19th and 20th century dresses, jackets, hats and boots, featuring exquisitely designed and often, individually crafted buttons. Colleen's buttons were complete sets, displayed on labeled cards. She doesn't like to separate sets and never sells only one button. Her fabulous slides showed buttons in fashion, for men and women, although, historically, men wore buttons much sooner than women. Buttons date from prehistoric times. As Colleen said, "...they were circular pleasures, treasures in the round, the original compact disk. " 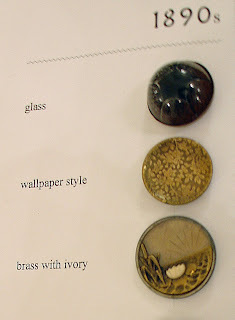 Buttons reflect design, history and culture. In the 16th century, there were rules for size; buttons could not be too big. They were made by every country. China was been the biggest producer of buttons. As early as 200 BC, stone and clay buttons were found in prehistoric tombs. They were used to fasten garments at the shoulder. Later, they were worn as shoulder broaches. At first, they were purely ornamental and were made of shells, ivory, bone and wood. The button hole was an Arabic invention. Before that, clothes were tied or broached but some women were sewn into their clothes, in the morning and at night the stitches were taken out. (Plenty of servants needed for this one.) 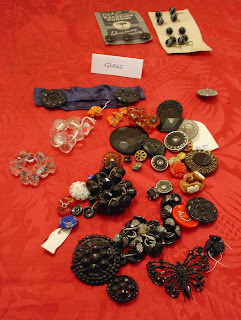 Buttons were indicators of century was the golden age of buttons in the British and French Royal Courts. During the French Revolution, there were famous face buttons and also pornographic buttons, worn on the inside of men's jackets. Peasants wore leather or pewter buttons. In the 18 social level and rank. In the Renaissance, buttons were all the rage for Royalty. They had their own goldsmith button makers. 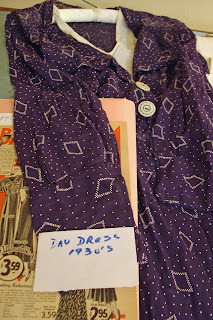 The button rule existed even then: women wore theirs on the right and men wore their on the left. 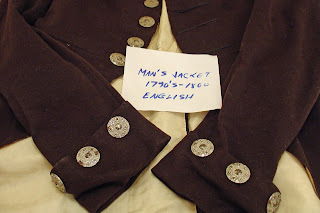 Dutch and Scottish men had four silver buttons on their shirts to attach their pants to the shirts. (No belts or suspenders until later) The 17thth century, landscape painting, glorifying nature was depicted on buttons. The Victorians loved travels: the South Seas and Egypt became picture 'postcard' buttons. This cultural, social and political recording continues today as travel, exploration, famous people, family and much more is depicted on t-shirts, although badges, pins, broaches and yes, buttons, Era, saw an explosion of colour and design and Bakelite. The 1970's were the lowest point in button history: mass production reduced abound. Celluloid buttons appeared in 1869 but the poorer classes wore glass buttons. In the early 20th century, buttons were readily available in dime stores, to all, however they were much less ornate and more simple and practical. the 1920's, the Art Nouveaucraftmanship and plastic was used more than natural materials. However, during the late 70's more creatively designed buttons began to appear. In 1982 Vivienne Westwood and Paul Gaultier featured buttons in their shows. Neat...I adore that beige coat! i awarded ur blog:) check my blog for the deets! your blog is such a gem. So cool... buttons are awesome. I've been looking for a button shop for the longest time. I think replacing a button or two can completely change a look of a gourmet. This is so interesting--I wish I could have been there for the whole presentation. I passed by the former Button, Button on Cordova and was sad to see it's gone. Do you know if it has a new location? Cute buttons are so fun. i use to have a huge collection of buttons. i sew them on shoes, turned them into earrings. well i practically went crazy with buttons. such a cool unusual exhibition!